Hey! Nielsen: Where the Black Box Meets the Soap Box? This week a site I've been working on, Hey! Nielsen, just launched to public beta. 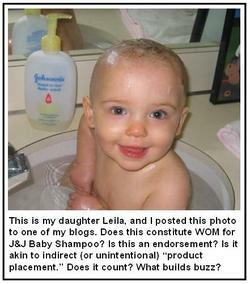 It's 100% about CGM, and has echoes of the first "consumer expression" business I started out of P&G, PlanetFeedback. In a nutshell, Hey! Nielsen provides a platform for consumers to rate, review, rant, react, and respond to all manner of content related to entertainment: TV, movies, music, personalities, websites (e.g Facebook, MySpace,), and more. In the coming months, a Spanish language version of the site, Oye! Nielsen, will roll-out. Nielsen essentially wants consumers to be heard, and its not being shy in suggesting the consumer opinions and non-personally identifiable data will be shared with big decision makers in the entertainment industry. What's clear in this new age of control is that the "power to be heard" has unique and important "social currency," and certain brands (Nielsen believes it's one of them) have unique credibility, as well as years of expertise in panel management for research purposes, to be the conduit. This is a big reason why I keep pounding away in this blog at the importance of business functions like consumer affairs in the new marketing mix; importantly, brands need to "mind their influencers," and the vast majority of them are right under their noses, eager to talk to them, with or without advertising stimuli. Consumer Megaphone as Corporate Matchmaker: Anyway, I just returned from a couple launch events and meetings in New York, and it's all pretty exciting -- and for many reasons beyond the obvious. This was an unusual project for Nielsen, and certainly the subject of lots of very healthy "conversation." Although my division Nielsen BuzzMetrics played an important role in the launch (strategic consulting, BlogPulse integration, marketing tactics), the initiative was coordinated and led right smack in the center by Nielsen Communications, a group which successfully (and quickly) brought together dozens of key stakeholders throughout the company to get us to this first phase (we have much more to do). There's an "Exportable AHA" (my new term for "takeaway") here. Consumer expression is serving as a powerful stimulus and catalyst to unite key stakeholders in large, sometimes siloed, organizations. I see this in every "CGM 101" training session I lead at major corporations. Everyone, it seems, has a stake (perhaps even some degree of fear and apprehension) in the "new rules of consumer expression," from communications and public relations to marketing and operations. The "vocal" consumer is what brings them together. On more than a few occasions, workshop attendees have approached me and said my presentation represented the first time they had ever met or interacted with some of their own colleagues. As I see it, that's both a breakthrough, and a huge opportunity. Anyway, give the site a test run! It's not out to become another Facebook or MySpace, but rather a very focused "open" platform on the very topics Nielsen is already tracking. I like to think of it as the place where the "black box meets the soap box." Also, if you know of folks who'd like to play a leadership role in this new venture, shoot me or Jennifer Geissel a message. Excellent interview on CGM analysis in Marc Glaser's MediaShift Blog featuring Jonathan Carson, CEO of BuzzMetrics and (in the beautiful spirit of full disclosure) my work colleague. Jonathan and I first met about three years ago while barnstorming the buzz/word-of-mouth measurements speaking circuit. 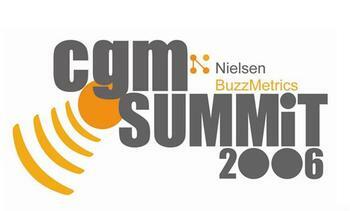 We then worked for competing companies in the still nascent buzz/CGM monitoring space. Along with Dave Balter of BzzAgent, we co-founded the Word-of-Mouth Marketing Association (WOMMA), and eventually ended up under the same corporate tent when VNU rolled up three CGM measurement players under the Nielsen brand: BuzzMetrics (which Jon co-founded), Intelliseek (my former company), and Israel-based Trendum. His interview covers all the key basics of CGM measurements, and then some. Jonathan also has a blog entitled the Mouthpiece which anyone passionate about CGM should subscribe to or bookmark. Friendly Debates. Buzz Divides. WOM Wars? The KellerFay Group, in conjuction with BzzAgent, just dropped a new report on word-of-mouth, drawing largely from solicited opinions from the BzzAgent panel. Very good read, with key learnings that both reinforce (with more focused clarity) what we know and suspect, as well as break open a few new opportunity zones. I particularly agree with the conclusion that "word of mouth marketing can produce impacts beyond spreading the word." Among their headline recos for marketers: "aim for higher impacts" (get consumers to website, drop samples, drop coupons), Go in-store ("foster interactions at point of purchase"...recall my "Ex-Spot" piece), Be Social ("build socialability in campaigns"), and Help Your Advocates be online and offline (create a blog, upload a demo video, etc). I'm always a bit skeptical about comments like "Again, the interactions need to be natural" (far easier said than done when marketing of any sort is at the heart of the process), but the spirit and intent of the comment (like the online video panel last week emphasizing "authenticity") is right. Definitional Scope: Is our definition of WOM too narrow? I'm obsessed with the term consumer-generated media (of which I consider WOM to be a subset) because I believe it speaks to a bigger tent of consumer expression, inclusive of "familiars" but well beyond that. Solicited Omissions: Do consumers have a precise handle on what they actually recommend or tell others about when you ask them directly? Do we as marketers even know how to ask the question in the right way? What are the right questions? Recommendational Parameters: What constitutes a recommendation or an endorsement, especially in the age of social media. Most of us are walking billboards for products and brands, often without even knowing it. It's especially common online where photo and video imagery allows us to capture a more complete picture of who we are, what we buy, and even the values we wrap around those attributes. I call this "indirect product placement." Is this word-of-mouth? Incidental WOM: How do we account for the indirect or incidental effect of WOM, especially via search engines. Most offline and online rumors are turbo-charged at the moment of search. Search results reinforce and "affirm" hunches and suspicions or curiousity-triggers, and the fact that the validation expressed in search results comes from consumers (i.e. more trusted than advertisers...even though we no earthly clue who these folks are) makes it even more powerful. Is this part of word-of-mouth? Quantifying Latency: Related, what's the "Net Present Value" of buzz that's permanent -- not fleeting or ephemeral. Just think about Jeff Jarvis and Dell. The power of that incident is the "latency effect" of the negative experience. The incident continues to create media...almost in perpetuity. How do we account for that? So What's Next: Anyway, it dawned on me a couple days ago after having a rather petty ("Dude, you're WRONG!") e-mail back and forth with my friend Dave Balter on this topic that we need to break open a fresh new conversation (a meme perhaps?) on this topic. Just to make it interesting -- dare I say, engaging -- I went ahead and registered the domain "WomWars.com" so we can really focus this debate. This is a really important conversation. If you agree, let me know, and I'll include you in the follow-up. Thanks for listening! 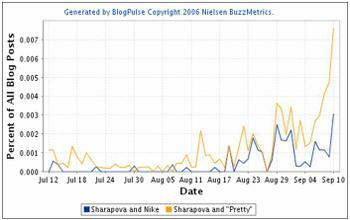 How much "return on CGM" did Nike receive off the Maria Sharapova "I Feel Pretty" ad aired on many occasions during the US Open? Equally important, how much "talk value" did the ad generate relative to other US Open spots, and why? These are important questions because CGM is increasingly play a de facto "auditing" role of advertising effectiveness and word-of-mouth. Consumers increasingly leave a digital trail, a "brand residue," in venues where they can easily and effortlessly express themselves: message boards, forums, online communities, social-network sites, and especially blogs. Often, this digital trail reinforces (or negates) the effectiveness of offline advertisings, especially TV ads. Through the return-on-investment (ROI) lens, the more favorable CGM a brand receives, the more the average cost per impression goes down. Nike Feels Pretty: The good news for Nike (full disclosure: a client, although I have no involvement with this campaign) is that the very clever "I Feel Pretty" spot -- whereby a long cast of characters sing portions of West Side Story's famous song while Maria Sharapova leaves her hotel for a tennis match -- generated an unprecedented amount of online conversation and buzz: on blogs, boards, YouTube, MySpace, and in many other places. Importantly, as you can see in the BlogPulse chart, there were a significant number of posts that explicitly referenced key elements of he ad. This, in my view, is a leading indicator of so-called "engagement." Conversational "Talk Drivers" - Know Them: What works particularly well for this ad is that there are so many entertaining and subtle "talk drivers." Conversation definitely plays back the details, and this is a big reason why CGM analysis is so critical to understand the effectiveness of Super Bowl commercials. Even in informal offline conversation, I've heard folks critique the specific characters, replay John McEnroe's reaction, and describe the wacky head of hair on one of hotel workers (see image to the left). Understanding how such drivers catalyze or extend conversations is part of the new art of marketing; it's also how we need to think about customer service; little things get noticed, and in turn drive conversation. Fortunately, for Nike, and their agency Weiden & Kennedy, most of the brand's ad copy manages to "jump the shark" to the online space because it consistently has details or elements or "kicker" endings that provoke buzz. Benchmarking Campaigns: Looking ahead, I envision more agencies being rewarded and compensated based on the extent to which their ad copy manages to infiltrate or extend into the CGM space. We'll pay attention to not only ad copy spillover, but also the effectiveness and "talk value" of any spokesperson's associated with the brand. 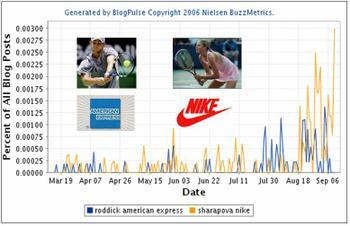 For example, sponsors clearly invested heavily against both Maria Sharapova and Andy Roddick, but Sharapova received significantly more playback in the context of the sponsoring brand, Nike, than Roddick with American Express. Then again, the story is yet to be fully told. The "Stop Pong" website associated with the Roddick spot may well keep that campaign in play longer than realize. At the end of the day, the CGM flow can provide a wealth of insight into TV advertising effectiveness. Did my copy generate buzz? Was it positive? Where was it discussed, and by whom? What specifically did viewers like? Was the ad viral, and, if so, what prompted the desire to share? If I didn't receive squat on the buzz front, why, and is it time to have a heart-to-heart with my agency? 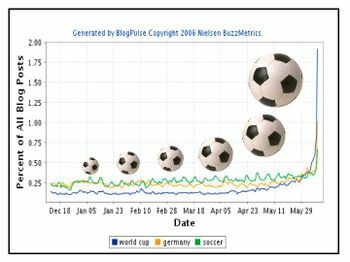 As the World Cup goes, so goes the blogosphere. It's top of mind across the spectrum of CGM sources. Passion is a key driver here. Here's a fun "woman on the street" video update from the WeAllSpeakFootball.com site. A blend of CurrentTV, Amanda Congdon's Rocketboom, and ESPN. 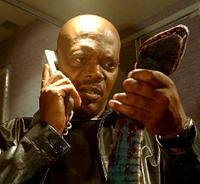 In this morning's ClickZ article -- "Are You Asking the Ultimate Marketing Question?" I recap some key themes from Fred Reichheld's excellent keynote presentation at the WOMMA conference, as well as offer a few suggestions for brands. Importantly, are brands asking the "ultimate question" to gauge propensity to recommend, which Reichheld argues is at the heart of a new accountability scorecard for companies and brands? 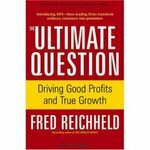 Reichheld's latest book "The Ultimate Question: Driving Good Profits and Good Growth" puts a fresh perspective and a few branded frameworks (e.g. Net Promoter..."bad profits") on a core argument that draws from The Service Profit Chain. In the age of virality, lifetime value simply isn't enough. The conversations that flow from good or bad experiences with brands directly impact the bottom line. When I'm not blogging, or partnering with my wife Erika to take care of our precious little twins, to I'm helping companies and brands "listen to" and "leverage" consumer-generated media. It's a great job because I really do believe companies and brands can do a much better job listening to the consumer. I also sincerely believe consumers have so much to offer companies, both on the insight, "early warning," and media evaluation front. Technology helps bring it all together. Today, I'm incredibly pleased to announce that that consumer-centered commitment is dialing up a big notch through the creation of a new company and brand, Nielsen BuzzMetrics, that brings together the company I work for, Intelliseek, and a company equally commited to excellence in consumer-generated media and word-of-mouth analytics, BuzzMetrics -- all under the Nielsen/VNU umbrella. BuzzMetrics, worth mentioning, is a fellow co-founder of the Word of Mouth Marketing Association, and shares our genuine commitment to marketing ethics, consumer trust, and deep consumer understanding. I'll let the release speak for itself, except to say that I am excited and energized this new development. Also appreciate the good wishes and congratulations from folks in the industry, from early investors like Fred Wilson and WOM evangelist Matt Galloway to the key bloggers in this space. First post of 2006...if you are serious about consumer-generated media (CGM), word-of-mouth, or the theory and practice of customer evangelism, you simply won't want to miss the Word-of-Mouth Market Association's "Basic Training" in Orlando, Florida January 19-20. The WOMMA team has put together what promises to be an amazing event -- speakers include the likes of Ad Age's Bob Garfield and "One Number You Need to Grow" author Fred Reichheld -- and if you are still scratching your head wondering if it's worth the investment, take a quick dip into a few of these excellent podcasts by conference speakers. Then again, if you don't need to be convinced, just sign up here.